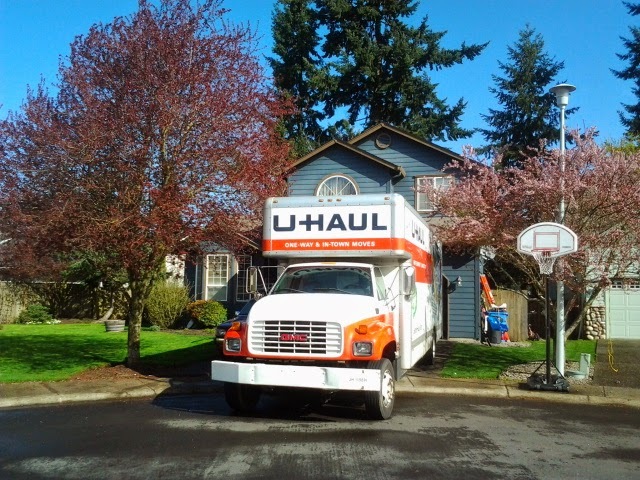 My son and his family have moved 5 times in 7 years. Last weekend was the fifth time. I think. A & C have become intimately acquainted with U-Haul trucks and storage units and late nights cleaning burnt ovens and dirty bathrooms. There are five(5!) children to move in this Collins tribe, which is no small feat. Kind of like moving the children of Israel, except without all the donkeys and camels. And sand. Children are resilient and creative (at least my grandkids are) and they’re usually up for an adventure. Moving house means life is topsy turvy for awhile, but if they have their pillows, sleeping bags and their just right blankets–along with 2 or 3 stuffed toys–they can smoosh it all in a Trader Joe’s bag and land just about anywhere. My granddaughter is a master at this–she smooths out her blankets on the floor, poofs up the pillow, lays her princess blanket on top with her bag of books and toys next to her head and she’s settled in. But how do we settle in? 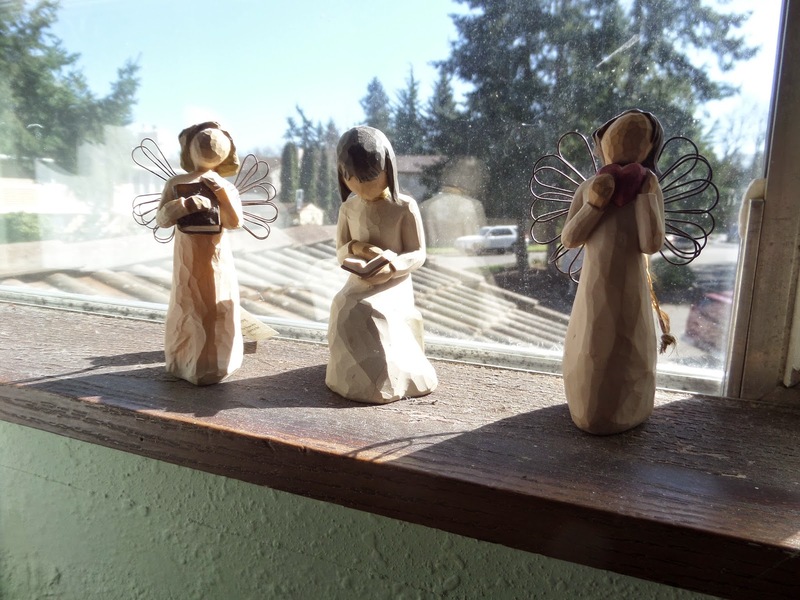 For my daughter-in-law it is the treasures on her windowsill that signal she’s at home–a heart-shaped rock, a seashell from the beach and one of her Willow Tree figurines (like the ones in MY window…angels and books). C’s favorite of her small collection is one of a young girl with her arms wide, a small bird perched on her shoulder. Maybe when she glances at it she imagines a bit of freedom, a chance to let go of cares and kids for a day, a chance to be Somewhere Else. I think when we know Jesus we ALL want to be Somewhere Else–with Him–to be in His sweet presence, to feel Him near, to hear His voice. Even tho’ I was made for fellowship with Him, a precious one-ship with my Saviour, my right-now life offers only glimpses of Him. A touch here and there through a song or something we read in The Word. A trickle of tears on a Sunday morning during worship, the warmth of His Spirit in prayer with a friend. But I live in the day to day, my home is here on the ground, not in Heaven. My daily view, the pieces of meaning adorning my windowsill include a heart-shaped rock (a family thing…), a spoon with the word ‘Grace’ engraved on the handle, birds and candles, the bits and pieces of beauty, like an anchor for my eyes and heart. Were I to become uprooted and need to move, like my son or the children of Israel, I’d probably pack up my window treasures and keep them close at hand. As soon as I arrived Wherever it Is, I’d put everything in place around me. No matter where I land, amid boxes and chaos, unmade beds and misplaced dishes, if I had that window world in place I’d feel at home. Anchored for now, settled in for the time being, but holding my Heavenly home in my heart. What helps you feel at home? 'Familiarity and memories are important parts of 'home'. Yes, I bet you do get it. Nancy. I hope I have time to hear some of your stories when we finally get together. Thank you for reading, friend. I get this–totally. During the years our children were growing up, we lived in seven homes. In the third one I hung baskets on a kitchen wall. In each one of four homes, for the next twenty-seven years, those baskets were hung on some wall of the current kitchen. Towards the end of that time, our older son asked me, “Mom, why do you still have those baskets on the wall?” I told him, “They make each new parsonage feel like home.” It would appear that familiarity and memories are important parts of “home,” a new house notwithstanding. I love this post, and I have a sweet windowsill at home that I am going to do something similar on. Thanks for the inspiration! Prayed for your family to find favor and make great memories in their new home.